I often sit out on my patio gazing at the moon and stars and wonder just what kinds of secrets the Universe may hold. So many little kids dream of being astronauts, I guess I might have too… but I have a myriad of control and claustrophobia issues, probably best left for my “psychiatrist in a box” post thats coming up tomorrow. In the meantime, check out spaceflight opportunities for the rest of you. Virgin Galactic Founder Sir Richard Branson revealed at the 2012 International Airshow in Farnborough that the company has now actually accepted deposits for the suborbital flights from around 529 brave men and women, all ready to become first time astronauts. All this as a life-sized replica of the flying machine SpaceShipTwo was unveiled at the show.This news comes following the recent testing that confirms all major components of SpaceShipTwo’s rocket system’s have been qualified for powered flight, leaving the craft on track to actually “lift off” before the end of the year. SpaceShipTwo actually takes flight from the back of Virgin Galactic’s proven WhiteKnightTwo, getting her aloft and ready to begin her suborbital missions. Thanks to the extreme flexibility of such an air launch, Virgin Galactic’s customers will enjoy reduced infrastructure costs in addition to the wide range of possible launch locations tailored to individual mission requirements and weather conditions. So if being pinned back in your seat as your brains and cheeks shift to the back of your head, while howling rocket motors propel you to 50 thousand feet into the air at about 3000 miles an hour (which is almost 4 times the speed of sound) into the weightless world of space sounds super appealing, Virgin Galactic has got a ticket they’d like to sell you, and at only 200 thousand dollars a pop, I’d make my reservations now! Hey, if I’m traveling at 4 times the speed of sound, will I be back on Earth before anyone can hear me screaming? 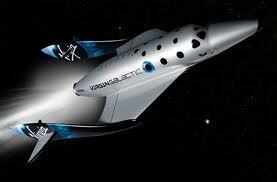 To book your seats please make your reservation with a Virgin Galacitic Space Agent, or visit virgingalactic.com.